Comments received during the consultation period and the EPA’s responses are summarised below. Extend the timeframe for publishing data (s2). The timeframe for publishing or providing data has been extended from 14 calendar days to 14 working days. Clarify the requirement to publish data on a ‘publically and prominently available’ webpage (s2, s3.1.1, s3.1.2). The Requirements clarify that the public should be able to find the data quickly and easily, within 3-4 mouse clicks, using a search engine. Clarify which websites are applicable for the data to be published on (s3.1.1). The Requirements clarify that where websites specific to the premises do not exist, data is required to be published on the website of the local, corporate (parent) or global website of the licensee. Provide a website of all licensees’ monitoring data websites (s3.1.1). The EPA has asked licensees for their website addresses by amending the Annual Return form. The EPA will include this information on the POEO public register, which also allows the public to download a list of all licensees including their location and contact details. The EPA should be an intermediary between members of the public requesting data and licensees (s3.1.3). The proposal is not supported as it would remove the opportunity for improved relationships to be formed between industry and the community. It would also require a sustained resource allocation for the EPA and delay the process for provision of data. Provide guidance on reasonable requests (s3.1.3). Text added to provide guidance on assessing the ‘reasonableness’ of requests. Allow licensees to publish a continuous feed of data (s3.2.2). Data may now be published graphically to enable a continuous live feed of monitoring data. Clarify the requirements of meaningful summaries (s3.2.1 & s3.8.1). Text added to clarify the requirements of meaningful summaries. Remove the requirement to publish ambient monitoring data (s3.3.1). Ambient monitoring data no longer needs to be published. Clarify when and how often the data needs to be published (s3.4). Text added to clarify when and how often the data needs to be published. It is no longer a requirement that a licensee publishes or provides obtained data points that they suspect are incorrect. However, licensees must include an explanatory note. Pdf formats are now an accepted format for published data. Allow data to be published in graphs (s3.5). Graphs showing a continuous live feed of monitoring data or long-term trends can now be published. Clarify that up to four years of data must be published (s3.6). The Requirements states that up to four years of data must be published. Remove the requirement to publish units of measure in full with the data (s3.7). The units of measure no longer need to be published in full with the data. This information is available in the relevant licence. Remove the requirement to publish the licensee’s address with the data (s3.7.1). The licensee’s address must be published with the data so that if needed the public can locate the licence on the EPAs public register. This would greatly reduce the amount of data that is made available to the public and reduce transparency. Relax the requirement to include maps of monitoring point locations (s3.7.2). A general description of each sampling or monitoring point can now be published. Include guidance on monitoring data without corresponding limits (s3.7.3). Guidance on this issue is provided. Reduce the requirement to publish data with date sampled, obtained and published (s3.7.4). Only the date obtained now needs to be published with the data. Remove the requirement to publish data where there were no discharges or where pollutant levels were below detection level (s3.7.7). Licensees no longer need to publish results of monitoring where there were no discharges during the monitoring period or where pollutant levels were below detection level of the measurement instrument, but must include an explanatory note. Clarify and simplify the example tables in s3.8.2 (s3.8.1). The example tables in s3.8.2 have been removed from the requirements. The previous section (3.8.1) has been amended to provide improved examples. Exclude data from pollution reduction programs (s5 & s5.2). Any data required to be collected for the purpose of a pollution reduction program is no longer required to be published. Include a definitions section (s7). A definitions section has been added to the Requirements. Provide for licensees to contact EPA regarding duplication with consent conditions requiring reporting (Appendix). An Appendix has been added to the Requirements stating that licensees can contact their local EPA office to discuss monitoring and reporting requirements. Suspend annual return requirements for licensees that publish data (N/A). The Annual Return provides more information to the EPA than just monitoring data and is a statement of the licensee’s compliance with its licence throughout the year more generally. 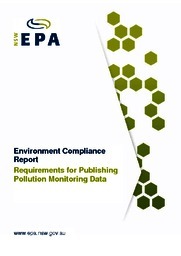 EPA to publish and rank all data (N/A). It is the responsibility of licensees to publish or provide their own monitoring data. EPA to report on cumulative impacts of pollution (N/A). This is beyond the scope of the Requirements. EPA to enable a system of self-policing and automatic infringement notices (N/A). This is considered legally and practically unfeasible. Expand the requirements to non-licensed premises and monitoring conducted outside of conditions (N/A). This is considered excessive and impractical and would require legislative amendments. Outline a complaint handling process (N/A). This is addressed on the EPA website.